My great-great grandfather Moses is kind of elusive. A name like Moses Cohen was not particularly distinctive in the time and place in which he lived (New York City, turn of the 20th century) and I have very few unique identifiers to add in searching for him. He was born around 1835, somewhere in eastern Europe – possibly Mlawa, Poland – and he arrived in the United States around 1870. I am pretty sure his wife, Feige (or Fanny) and 5 children arrived independently in 1873, joining him in the life he’d begun to carve out as a peddler and a teacher on the Lower East Side. His family continued to grow in New York – my great-grandmother Anna was born there in 1879 and her older sister Sadie was born around 1876. In 1880, his eldest, Rebecca, was newly married and he had three sons at home – Harris, Samuel and Israel – in addition to the two little girls – living in what was probably a typical Manhattan tenement apartment. 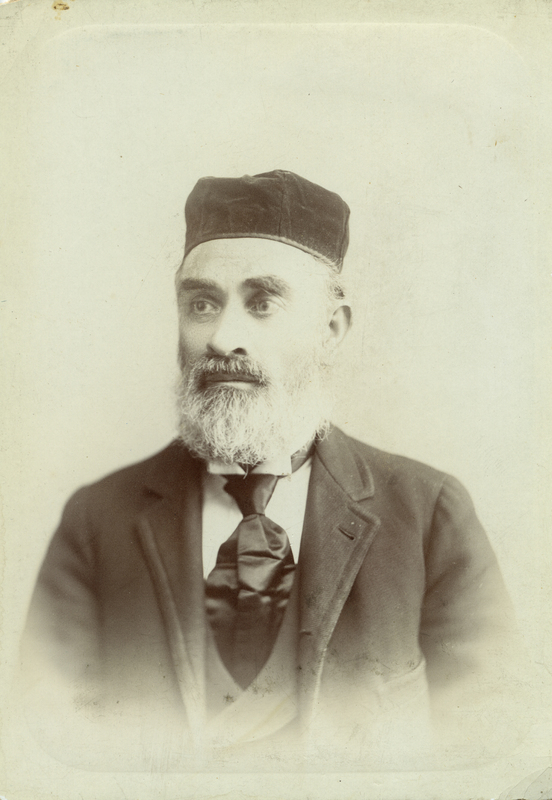 His wife Fanny died sometime between 1880 and 1900 – and Moses spent the remainder of his life apparently working as either a German or a Hebrew teacher, living with his son Sam and his daughter Sadie. Here, he looks very dignified, starched and pressed – his beard neatly trimmed and his eyes unwavering, even though his tie still has creases in it from being folded up and his coat is of a relatively rough weave. This is a man who probably worked hard and scraped by, and who was hopefully gratified by the relative successes of his children, who moved out of the crowded tenements of the Lower East Side, out to bigger apartments in Brooklyn or their own houses in Pennsylvania. Hopefully he wouldn’t be too disappointed about the assimilationist route his family took – and would be thankful they still at least went to seders last night and attend synagogue for holidays, albeit synagogues different than any he ever could have imagined.